When I first became interested in cricket, Bishan Singh Bedi was our family favourite. To us, he epitomised the mysticism of India and, with his colourful patkas and beautiful bowling action, we were enraptured by him. The first Test I went to was England against India at Lord's in 1979 and it was a pleasure watching Bedi, if only on that day with the bat which didn't last long. It is therefore a real pleasure to see this biography appear on one of the great Indian legends. Having read another book by Suresh Menon, I was delighted to see that he has written this excellent biography of Bedi. We learn a great deal about the man's personality and that, behind the outspokenness, there is a very warm and amusing man. I was lucky to witness this in 2002 when I met him for the only time. We are told how the young Bedi fancied himself as a fast bowler but was persuaded to take up spin bowling and how, with very slight finger changes, he could bowl six different deliveries in an over whilst remaining formidably accurate. The vastly experienced Indian spin quartet in the late 1960s and 1970s is mentioned in detail as are the issues surrounding selection and the differences in captains Tiger Pataudi and Ajit Wadekar. It is refreshing to read that Bedi was unwilling to bowl flatter to adapt to the perceived needs of One-Day International cricket and how he would clap batsmen who had successfully attacked him. Bedi may not have been the best batsman or fielder but it is nice to see cricketers picked for one facet and he gave much pleasure all over the world. 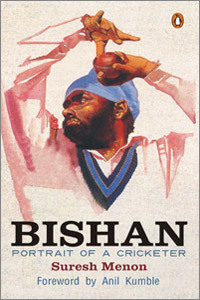 This book tells us everything which we could hope to know about Bishan Singh Bedi. There may be only one photograph but the statistics by Gururaj Rao are exemplary and very in depth. The cover portrait is spot-on and this book is an invaluable one for any reader wishing to know about one of the great spin bowlers.